I was chatting to another mum in the school yard the other day and we were talking about how hard it is to choose those incidental gifts; the ones you give to your neighbour, your hairdresser, teachers and workmates. It can get expensive and really difficult to think up meaningful gifts on top of all the other major presents of the season, and so I’ve always gone the home-made route. You can make a few different things, with minimal cost, and because you’ve made it yourself, the resulting sweets and treats become worth more than just the sum of their parts. 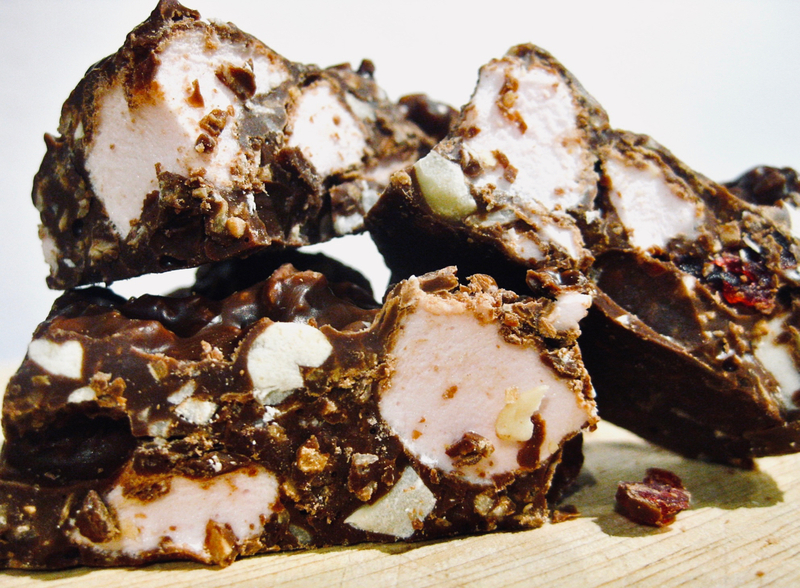 In years past I’ve made roasted spiced nuts, maple-syrup honeycomb, caramel popcorn, bejewelled chocolate drops, melting moments, salted peanut chocolate slab , my wonderful walnut truffles and now, here’s the recipe for my ravishing rocky road. Melt the two chocolates together, however you best feel comfortable, but remember to go easy. Don’t cook the chocolate. Throw in the ingredients as you please and mix. You might prefer more chocolate:filling ratio or you might like it jam-packed with stuff. Spread the mixture into a lined slice tray and leave to set in the fridge. Cut it up into bite-sized pieces, wrap some up in cellophane and give as gifts to your friends and family.